The first batch of the charity fezzes are nearly done and will be heading to their generous new owners this week. I will likely start on the next batch this weekend. 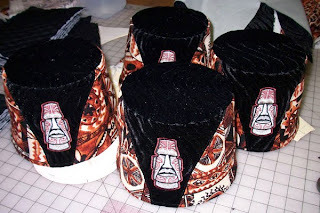 These Limited Edition fezzes are cut from tapa cloth out of my personal stash and I only have enough fabric to make about 13 of these fezzes. So if you are interested in getting one of these Limited Edition gems, I suggest you act quickly. Just follow the link to learn how to make your tax deductible donation and I will gladly reward your generosity with a special fez.